Neena & Veena are artistic directors and choreographers of their own dance company that specialize in Dances of India (including bhangra, bollywood, folkloric, and classical), and Dance of the Middle East/North Africa. The twins had the first professional company of its kind in North America. Many of their live shows consists of dancers, singers, musicians, as well as specialty performers with authentic, dazzling costumes from top designers from India, Pakistan, Egypt, and Turkey. Some of their live productions include “Bollyworld,” “Journey thru the Veil,” “Tere Mehfil,” and “Hooray for Bollywood” all directed, produced, choreographed, and performed by the twins. Most of the shows ranged from 4 to 60 performers. 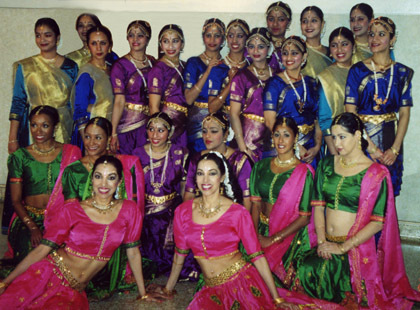 Their energetic, breathtaking Indian/Bollywood and Middle Eastern/belly dance shows meet the demands of the growing East Indian-American and Arabic-speaking populations. Their shows continue to receive rave reviews from the press and audiences worldwide. Because of their reputation for high-production value live and media shows, they have been hired by clients of all ethnicities, including A-list celebrities and dignitaries, to produce, direct and/or perform for galas, concerts, films, television shows and commercials, as well as many other prestigious events all over the world.